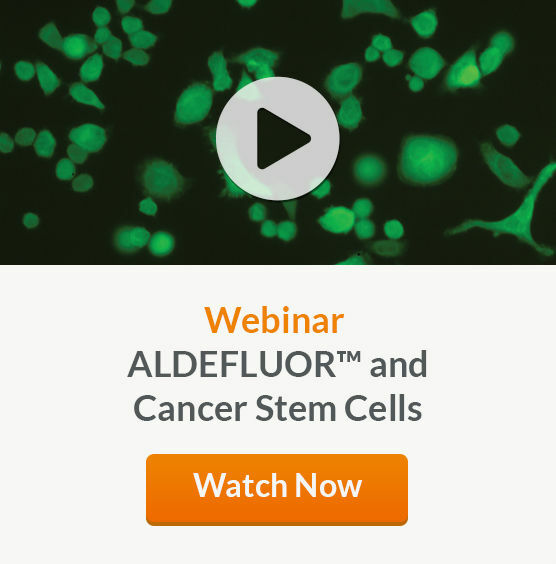 ALDEFLUOR™ is a non-immunological fluorescent reagent system that has supported over 1000 publications for the detection of aldehyde dehydrogenase-bright (ALDHbr) cells in over 80 different tissues. 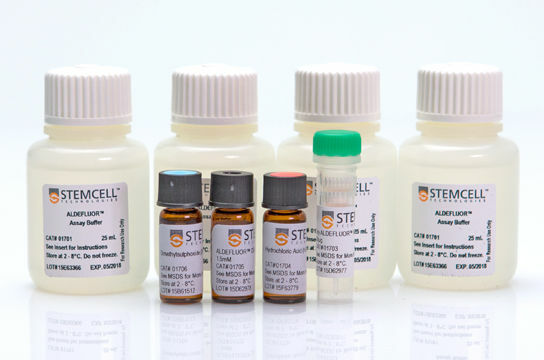 High expression of ALDH has been reported for normal and cancer stem and progenitor cells of various lineages, including hematopoietic, mammary, endothelial, mesenchymal and neural cells. Only cells with an intact cellular membrane can retain the ALDEFLUOR™ reaction product, making this system selective for viable ALDHbr cells. ALDEFLUOR™ is a non-toxic and easy-to-use kit that requires no antibody staining, and is compatible with standard cell sorters and analyzers. 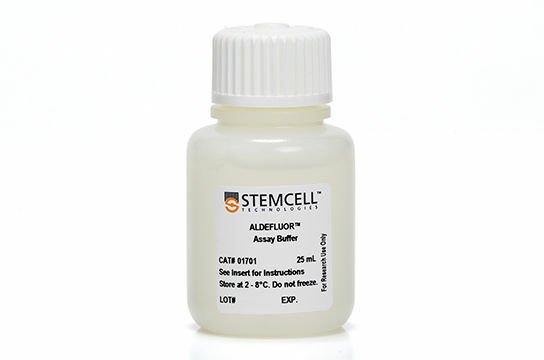 The ALDEFLUOR™ kit contains BODIPY-aminoacetaldehyde (BAAA), a fluorescent non-toxic substrate for ALDH, which freely diffuses into intact and viable cells. In the presence of ALDH, BAAA is converted into BODIPY-aminoacetate (BAA), a negatively charged product that is retained inside the cells. Intracellular accumulation of BAA leads to increased fluorescence, and these ALDH-bright (ALDHbr) cells can be analyzed with flow cytometry. Watch this video to learn more about how ALDEFLUOR™ works. ALDEFLUOR™ was initially developed and optimized for the detection of ALDHbr hematopoietic stem and progenitor cells in human blood and bone marrow. Since then it has also been shown to detect normal and neoplastic cells in many other tissue types (including breast, colon, lung, pancreas and thyroid) as well as cancer cell lines. Optimizing the ALDEFLUOR™ protocol to your tissue type of interest can dramatically increase the fluorescence intensity, thereby optimizing the assay performance. Watch this video to see an example of how our scientists increased the fluorescence intensity of ALDHbr cells in mammary tissue, and how you can modify the protocol to fit your research needs. NO ANTIBODIES. Detect viable normal or cancer progenitor cells based on ALDH activity. No antibody staining required. VERSATILE. Can be used with multiple cell types and species. INFORMATIVE. Identifies only viable cells with an intact cell membrane. Compatible with immunophenotyping. WIDELY-PUBLISHED. Has supported more than 1000 peer-reviewed publications. EASY-TO-USE. Simple protocol with highly reproducible results. Compatible with standard cell sorters or analyzers. Boxall SA et al. (2008) Haematopoietic repopulating activity in human cord blood CD133+ quiescent cells. Bone Marrow Transplant 43(8): 627-35. Capoccia BJ et al. (2009) Revascularization of ischemic limbs after transplantation of human bone marrow cells with high aldehyde dehydrogenase activity. Blood 113(21): 5340-51. Christ O et al. (2007) Improved purification of hematopoietic stem cells based on their elevated aldehyde dehydrogenase activity. Haematologica 92(9): 1165-72. Fallon P et al. (2003) Mobilized peripheral blood SSCloALDHbr cells have the phenotypic and functional properties of primitive haematopoietic cells and their number correlates with engraftment following autologous transplantation. Br J Haematol 122: 99-108. Gentry T et al. (2007) Isolation of early hematopoietic cells, including megakaryocyte progenitors, in the ALDH-bright cell population of cryopreserved, banked UC blood. Cytotherapy 9(6): 569-76. Gentry T et al. (2007) Simultaneous isolation of human BM hematopoietic, endothelial and mesenchymal progenitor cells by flow sorting based on aldehyde dehydrogenase activity: implications for cell therapy. Cytotherapy 9(3): 259-74. Gündüz E et al. (2010) Evaluation of mobilized peripheral stem cells according to CD34 and aldehyde dehydrogenase expression and effect of SSC(lo) ALDH(br) cells on hematopoietic recovery. Cytotherapy 12(8): 1006-12. Hess DA et al. (2004) Functional characterization of highly purified human hematopoietic repopulating cells isolated according to aldehyde dehydrogenase activity. Blood 104(6): 1648-55. Hess DA et al. (2008) Widespread nonhematopoietic tissue distribution by transplanted human progenitor cells with high aldehyde dehydrogenase activity. Stem Cells 26(3): 611-20. Liu C et al. (2010) Progenitor cell dose determines the pace and completeness of engraftment in a xenograft model for cord blood transplantation. Blood 116(25): 5518-27. Muramoto GG et al. (2010) Inhibition of aldehyde dehydrogenase expands hematopoietic stem cells with radioprotective capacity. Stem Cells 28(3): 523-34. Pearce DJ & Connet D. (2007) The combined use of Hoechst efflux ability and aldehyde dehydrogenase activity to identify murine and human hematopoietic stem cells. Exp Hematol 35(9): 1437-46. Pierre-Louis O et al. (2009) Dual SP/ALDH functionalities refine the human hematopoietic Lin-CD34+CD38- stem/progenitor cell compartment. Stem Cells 27(10): 2552-62. Povsic TJ et al. (2009) Aldehyde dehydrogenase activity allows reliable EPC enumeration in stored peripheral blood samples. J Thromb Thrombolysis 28(3): 259-65. Povsic TJ et al. (2010) Aging is not associated with bone marrow-resident progenitor cell depletion. J Gerontol A Biol Sci Med Sci 65(10): 1042-50. Sondergaard CS et al. (2010) Human cord blood progenitors with high aldehyde dehydrogenase activity improve vascular density in a model of acute myocardial infarction. J Transl Med 8: 24. Storms RW et al. (1999) Isolation of primitive human hematopoietic progenitors on the basis of aldehyde dehydrogenase activity. Proc Natl Acad Sci U S A 96: 9118-23. Shoulars K et al. (2016) Development and validation of a rapid, aldehyde dehydrogenase bright-based cord blood potency assay. Blood 127(19):2346-54. Carpentino JE et al. (2009)Aldehyde dehydrogenase-expressing colon stem cells contribute to tumorigenesis in the transition from colitis to cancer. Cancer Res 69(20): 8208-15. Huang EH et al. (2009) Aldehyde dehydrogenase 1 is a marker for normal and malignant human colonic stem cells (SC) and tracks SC overpopulation during colon tumorigenesis. Cancer Res 69(8): 3382-9. Povsic TJ et al. (2009) Common endothelial progenitor cell assays identify discrete endothelial progenitor cell populations. Am Heart J 157(2): 335-44. Moreb JS et al. (2007) Heterogeneity of aldehyde dehydrogenase expression in lung cancer cell lines is revealed by Aldefluor flow cytometry-based assay. Cytometry B Clin Cytom 72(4): 281-9. Ginestier C et al. (2007) ALDH1 is a marker of normal and malignant human mammary stem cells and a predictor of poor clinical outcome. Cell Stem Cell 1(5): 555-67. Liu S et al. (2008) BRCA1 regulates human mammary stem/progenitor cell fate. Proc Natl Acad Sci U S A 105(5): 1680-5. Nagano M et al. (2010) Hypoxia responsive mesenchymal stem cells derived from human umbilical cord blood are effective for bone repair. Stem Cells Dev 19(8): 1195-210. Jean E et al. (2011) Aldehyde dehydrogenase activity promotes survival of human muscle precursor cells. J Cell Mol Med 15(1):119-33. Vauchez K et al. (2009) Aldehyde dehydrogenase activity identifies a population of human skeletal muscle cells with high myogenic capacities. Mol Ther 17(11): 1948-58. Cai J et al. (2004) Membrane properties of rat embryonic multipotent neural stem cells. J Neurochem 88(1): 212-26. Corti S et al. (2006) Identification of a primitive brain-derived neural stem cell population based on aldehyde dehydrogenase activity. 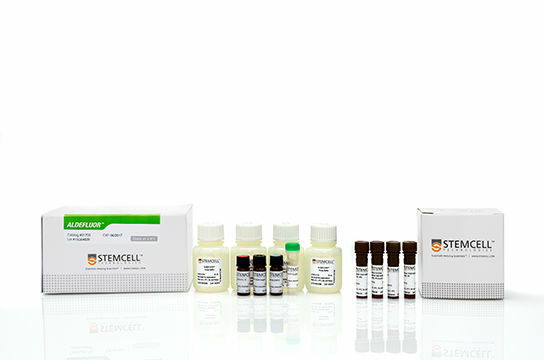 Stem Cells 24(4): 975-85. Corti S et al. (2006) Transplanted ALDHhiSSClo neural stem cells generate motor neurons and delay disease progression of nmd mice, an animal model of SMARD1. Hum Mol Genet 15(2): 167-87. Corti S et al. (2008) Neural stem cell transplantation can ameliorate the phenotype of a mouse model of spinal muscular atrophy. J Clin Invest 118(10): 3316-30. Obermair FJ et al. (2010) A novel classification of quiescent and transit amplifying adult neural stem cells by surface and metabolic markers permits a defined simultaneous isolation. Stem Cell Res 5(2): 131-43. Rovira M et al. (2010) Isolation and characterization of centroacinar/terminal ductal progenitor cells in adult mouse pancreas. Proc Natl Acad Sci U S A 107(1): 75-80. Yao M et al. (2010) Prostate-regenerating capacity of cultured human adult prostate epithelial cells. Cells Tissues Organs 191(3): 203-12. Alison MR et al. (2011) Cancer Stem Cells: Problems for Therapy? J Pathol 223(2): 147-161. Alison MR et al. (2010) Finding Cancer Stem Cells: Are Aldehyde Dehydrogenases Fit for Purpose? J Pathol 222(4): 335-44. Ma I & Allan AL. (2011) The Role of Human Aldehyde Dehydrogenase in Normal and Cancer Stem Cells. Stem Cell Rev & Rep 7(2): 292-306. Boucher K et al. (2012) Stemness of B-Cell Progenitors in Multiple Myeloma Bone Marrow. Clin Cancer Res 18(22): 6155-68. Gerber JM et al. (2012) A Clinically Relevant Population of Leukemic CD34+ CD38- Cells in Acute Myeloid Leukemia. Blood 119(15): 3571-77. Hanke M et al. (2014) Differences Between Healthy Hematopoietic Progenitors and Leukemia Cells with Respect to CD44 Mediated Rolling Versus Adherence Behavior on Hyaluronic Acid Coated Surfaces. Biomaterials 35(5): 1411-9.
de Leeuw DC et al. (2014) Attenuation of MicroRNA-126 Expression That Drives CD34+ 38- Stem/Progenitor Cells in Acute Myeloid Leukemia Leads to Tumor Eradication. Cancer Res 74(7): 2094-105. Man CH et al. (2012) Sorafenib Treatment of FLT3-ITD+ Acute Myeloid Leukemia: Favorable Initial Outcome and Mechanisms of Subsequent Nonresponsiveness Associated with the Emergence of a D835 Mutation. Blood 119(22): 5133-43. Nakamura S et al. (2010) The FOXM1 Transcriptional Factor Promotes the Proliferation of Leukemia Cells Through Modulation of Cell Cycle Progression in Acute Myeloid Leukemia. Carcinogenesis 31(11): 2012-21. Yang Y et al. (2013) RAR2 Expression Confers Myeloma Stem Cell Features. Blood 122(8): 1437-47. Choi SA et al. (2013) Identification of Brain Tumour Initiating Cells Using the Stem Cell Marker Aldehyde Dehydrogenase. Eur J Cancer 50(1): 137-49. Rasper M et al. (2010) Aldehyde Dehydrogenase 1 Positive Glioblastoma Cells Show Brain Tumor Stem Cell Capacity. Neuro Oncol 12(10): 1024-33. Sun P et al. (2009) DNER, an Epigenetically Modulated Gene, Regulates Glioblastoma-Derived Neurosphere Cell Differentiation and Tumor Propagation. Stem Cells 27(7): 1473-86. Alam M et al. (2013) MUC1-C Oncoprotein Activates ERK→C/EBP Signaling and Induction of Aldehyde Dehydrogenase 1A1 in Breast Cancer Cells. J Biol Chem 288(43): 30892-903. Atkinson RL et al. (2013) Cancer Stem Cell Markers Are Enriched in Normal Tissue Adjacent to Triple Negative Breast Cancer and Inversely Correlated with DNA Repair Deficiency. Breast Cancer Res 15(5): R77. Azzam DJ et al. (2013) Triple Negative Breast Cancer Initiating Cell Subsets Differ in Functional and Molecular Characteristics and in γ-Secretase Inhibitor Drug Responses. EMBO Mol Med 5(10): 1502-22. Buckley NE et al. (2013) BRCA1 Is a Key Regulator of Breast Differentiation Through Activation of Notch Signalling with Implications for Anti-Endocrine Treatment of Breast Cancers. Nucl Acids Res 41(18): 8601-14. Buijs JT et al. (2012) The BMP2/7 Heterodimer Inhibits the Human Breast Cancer Stem Cell Subpopulation and Bone Metastases Formation. Oncogene 31(17): 2164-74. Chen D et al. (2013) ANTXR1, a Stem Cell-Enriched Functional Biomarker, Connects Collagen Signaling to Cancer Stem-Like Cells and Metastasis in Breast Cancer. Cancer Res 73(18): 5821-33. Conti L et al. (2013) The Noninflammatory Role of High Mobility Group Box 1/Toll-Like Receptor 2 Axis in the Self-Renewal of Mammary Cancer Stem Cells. FASEB J 27(12): 4731-44. Ithimakin S et al. (2013) HER2 Drives Luminal Breast Cancer Stem Cells in the Absence of HER2 Amplification: Implications for Efficacy of Adjuvant Trastuzumab. Cancer Res 73(5): 1635-46. Kundu N et al. (2014) Prostaglandin E Receptor EP4 Is a Therapeutic Target in Breast Cancer Cells with Stem-Like Properties. Breast Cancer Res TR 143(1): 19-31. Liu S et al. (2008) BRCA1 Regulates Human Mammary Stem/ Progenitor Cell Fate. PNAS 105(5): 1680-85. Liu P et al. (2013) Disulfiram Targets Cancer Stem-Like Cells and Reverses Resistance and Cross-Resistance in Acquired Paclitaxel-Resistant Triple-Negative Breast Cancer Cells. Brit J Cancer 109(7): 1876-85. Londoño-Joshi AI et al. (2014) Effect of Niclosamide on Basal-Like Breast Cancers. Mol Cancer Ther 13(4):800-11. McClements L et al. (2013) Targeting Treatment-Resistant Breast Cancer Stem Cells with FKBPL and its Peptide Derivative, AD-01, Via the CD44 Pathway. Clin Cancer Res 19(14): 3881-93. Piva M et al. (2014) Sox2 Promotes Tamoxifen Resistance in Breast Cancer Cells. EMBO Mol Med 6(1): 66-79. Rustighi A et al. (2014) Prolyl-Isomerase Pin1 Controls Normal and Cancer Stem Cells of the Breast. EMBO Mol Med 6(1): 99-119. Salvador MA et al. (2013) The Histone Deacetylase Inhibitor Abexinostat Induces Cancer Stem Cells Differentiation in Breast Cancer with Low Xist Expression. Clin Cancer Res 19(23): 6520-31. Vazquez-Martin A et al. (2013) Reprogramming of Non-Genomic Estrogen Signaling by the Stemness Factor SOX2 Enhances the Tumor-Initiating Capacity of Breast Cancer Cells. Cell Cycle 12(22): 3471-77. Wang X et al. (2013) PPARγ Maintains ERBB2-Positive Breast Cancer Stem Cells. Oncogene 32(49): 5512-21. Yamamoto M et al. (2013) NF-κB Non-Cell-Autonomously Regulates Cancer Stem Cell Populations in the Basal-Like Breast Cancer Subtype. Nat Commun 4: 2299. Yu F et al. (2011) Kruppel-Like Factor 4 (KLF4) is Required for Maintenance of Breast Cancer Stem Cells and for Cell Migration and Invasion. Oncogene 30(18): 2161-272. Zhou Y et al. (2014) The miR-106b25 Cluster Promotes Bypass of Doxorubicin-Induced Senescence and Increase in Motility and Invasion by Targeting the E-Cadherin Transcriptional Activator EP300. Cell Death Differ 21(3): 462-74. Lotti F et al. (2013) Chemotherapy Activates Cancer-Associated Fibroblasts to Maintain Colorectal Cancer-Initiating Cells by IL-17A. J Exp Med 210(13): 2851-72. Lu J et al. (2013) Endothelial Cells Promote the Colorectal Cancer Stem Cell Phenotype Through a Soluble Form of Jagged-1. Cancer Cell 23(2): 171-85. Morris KT et al. (2014) G-CSF and G-CSFR are Highly Expressed in Human Gastric and Colon Cancers and Promote Carcinoma Cell Proliferation and Migration. Brit J Cancer 110: 1211-20. Ni C et al. (2013) IFN- Selectively Exerts Pro-Apoptotic Effects on Tumor-Initiating Label-Retaining Colon Cancer Cells. Cancer Lett 336(1): 174-84. Swindall AF et al. (2013) ST6Gal-I Protein Expression Is Upregulated in Human Epithelial Tumors and Correlates with Stem Cell Markers in Normal Tissues and Colon Cancer Cell Lines. Cancer Res 73(7): 2368-78. Todaro M et al. (2010) Colon Cancer Stem Cells: Promise of Targeted Therapy. Gastroenterology 138(6): 2151-62. Volonté A et al. (2014) Cancer-Initiating Cells from Colorectal Cancer Patients Escape from T Cell–Mediated Immunosurveillance In Vitro Through Membrane-Bound IL-4. J Immunol 192(1): 523- 32. Bertrand G et al. (2014) Targeting Head and Neck Cancer Stem Cells to Overcome Resistance to Photon and Carbon Ion Radiation. Stem Cell Rev Rep 10(1): 114-26. Clay MR et al. (2010) Single-Marker Identification of Head and Neck Squamous Cell Carcinoma Cancer Stem Cells with Aldehyde Dehydrogenase. Head Neck 32(9): 1195-201. Krishnamurthy S et al. (2010) Endothelial Cell-Initiated Signaling Promotes the Survival and Self-Renewal of Cancer Stem Cells. Cancer Res 70(23): 9969-78. Lo JF et al. (2011) The Epithelial-Mesenchymal Transition Mediator S100A4 Maintains Cancer-Initiating Cells in Head and Neck Cancers. Cancer Res 71(5): 1912-23. Xie X et al. (2014) Targeting HPV16 E6-p300 Interaction Reactivates p53 and Inhibits the Tumorigenicity of HPV-Positive Head and Neck Squamous Cell Carcinoma. Oncogene 33(8): 1037-46. Yu CC et al. (2013) miR145 Targets the SOX9/ADAM17 Axis to Inhibit Tumor-Initiating Cells and IL-6-Mediated Paracrine Effects in Head and Neck Cancer. Cancer Res 73(11): 3425-40. Zhang M et al. (2014) Elevated Intrinsic Cancer Stem Cell Population in Human Papillomavirus-Associated Head and Neck Squamous Cell Carcinoma. Cancer 120(7): 992-1001. Bleau AM et al. (2014) New Syngeneic Inflammatory-Related Lung Cancer Metastatic Model Harboring Double KRAS/WWOX Alterations. Int J Cancer 135(11):2516-27. Noto A et al. (2013) Stearoyl-CoA Desaturase-1 Is a Key Factor for Lung Cancer-Initiating Cells. Cell Death Dis 4(12): e947. Ricci A et al. (2013) TrkB is Responsible for EMT Transition in Malignant Pleural Effusions Derived Cultures from Adenocarcinoma of the Lung. Cell Cycle 12(11): 1696-703. Sullivan JP et al. (2010) Aldehyde Dehydrogenase Activity Selects for Lung Adenocarcinoma Stem Cells Dependent on Notch Signaling. Cancer Res 70(23): 9937-48. Yae T et al. (2012) Alternative Splicing of CD44 mRNA by ESRP1 Enhances Lung Colonization of Metastatic Cancer Cell. Nature Comm 3: 883. Abelson S et al. (2012) Intratumoral Heterogeneity in the Self-Renewal and Tumorigenic Differentiation of Ovarian Cancer. Stem Cells 30(3): 415-24. Bareiss PM et al. (2013) SOX2 Expression Associates with Stem Cell State in Human Ovarian Carcinoma. Cancer Res 73(17): 5544- 55. Flesken-Nikitin A et al. (2013) Ovarian Surface Epithelium at the Junction Area Contains a Cancer-Prone Stem Cell Niche. Nature 495(7440): 241-5. Kryczek I et al. (2011) Expression of Aldehyde Dehydrogenase and CD133 Defines Ovarian Cancer Stem Cells. Int J Cancer 130(1): 29-39. Silva IA et al. (2011) Aldehyde Dehydrogenase in Combination with CD133 Defines Angiogenic Ovarian Cancer Stem Cells that Portend Poor Patient Survival. Cancer Res 71(11): 3991-4001. Cano CE et al. (2014) Genetic Inactivation of Nurp1 Acts as a Dominant Suppressor Event in a Two-Hit Model of Pancreatic Carcinogenesis. Gut 63(6):984-95. Herreros-Villanueva M et al. (2013) SOX2 Promotes Dedifferentiation and Imparts Stem Cell-Like Features to Pancreatic Cancer Cells. Oncogenesis 2(8): e61. Liu L et al. (2014) Triptolide Reverses Hypoxia-Induced Epithelial– Mesenchymal Transition and Stem-Like Features in Pancreatic Cancer by NF-κB Downregulation. Int J Cancer 134(10): 2489- 503. Rasheed Z et al. (2010) Isolation of Stem Cells from Human Pancreatic Cancer Xenografts. J Vis Exp (43): 2169. Jeter CR et al. (2011) NANOG Promotes Cancer Stem Cell Characteristics and Prostate Cancer Resistance to Androgen Deprivation. Oncogene 30: 3833-45. Le Magnen C et al. (2013) Characterization and Clinical Relevance of ALDHbright Populations in Prostate Cancer. Clin Cancer Res 19(19): 5361-71.
van den Hoogen C et al. (2010) High Aldehyde Dehydrogenase Activity Identifies Tumor-Initiating and Metastasis-Initiating Cells in Human Prostate Cancer. Cancer Res 70(12): 5163-73. Sangiolo D et al. (2014) Cytokine-Induced Killer Cells Eradicate Bone and Soft-Tissue Sarcomas. Cancer Res 74(1): 119-29. Wang L et al. (2011) Prospective Identifi cation of Tumorigenic Osteosarcoma Cancer Stem Cells in OS99-1 Cells Based on High Aldehyde Dehydrogenase Activity. Int J Cancer 128(2): 294-303. Boonyaratanakornkit JB et al. (2010) Selection of Tumorigenic Melanoma Cells Using ALDH. J Invest Dermatol 130(12): 2799– 808. Todaro M et al. (2010) Tumorigenic and Metastatic Activity of Human Thyroid Cancer Stem Cells. Cancer Res 70(21): 8874-85. ALDEFLUOR is a trademark of Aldagen Inc.